Does this present a Takeover opportunity for you? Will this deal go wrong, or will Flybe shares rise even further? The chart shows the Flybe share price movements since late October. 23 Nov: Brokers at Goodbody say Virgin Atlantic might be interested in parts of Flybe but is unlikely to want the whole business. Will the deal be abandoned, will the deal fall through or will another even higher offer emerge to acquire the company? 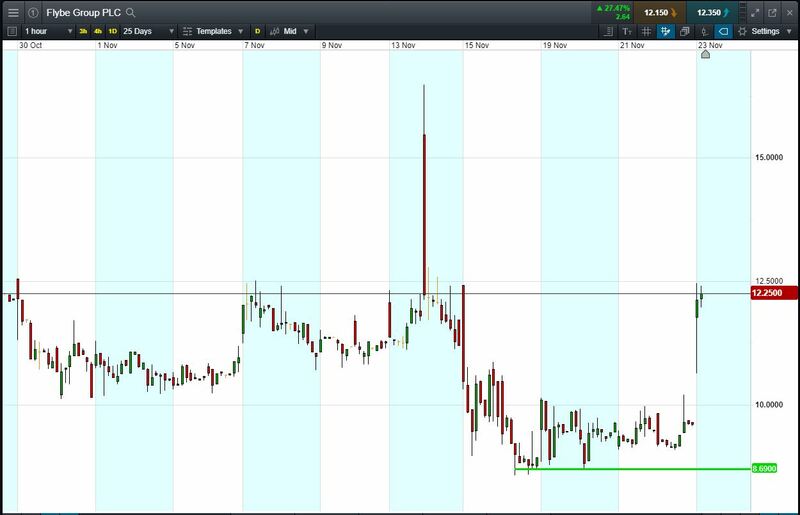 Let’s say you think that Flybe is likely to rise further as a result of a takeover offer beyond 16.5p November highs. You decide to buy exposure to £10,000 worth of Flybe using a CFD, at the current price of 12.25p. To do this, you need £2,000. For the purpose of this example, let’s assume the Flybe share price rises by 10%. Your profit would be £1000, from your initial investment of £2,000. Conversely, let’s assume you open the above position, and place a stop-loss at 5% from the current price. Sentiment towards the deal sours and Flybe shares fall 5% and hit your stop-loss. Your loss would be £500.